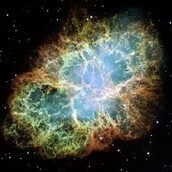 It is the reflection of stars or rotating neutrons. It is made out of a mix of hydrogen,grains,and space dust.It also has a second name which is star factories.And when a nebula is shrinking it is making the gas hotter. Hydrogen makes helium which makes (nuclear fusion) at -18,000,000 DEG F.And it takes about 10,000 to 1,000,000 years to make it turn in to a star. There are many famous nebulae like the Crab nebula, the Trifid nebula,and the Veil nebula. 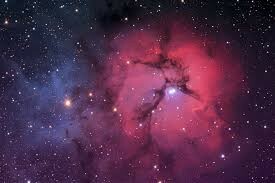 The Trifid nebula is one of the famous treasures in the summer milky way. 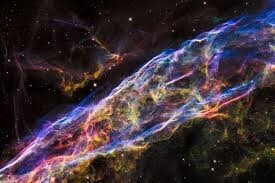 It name means divided into three lobes, but you need a telescope to see why. The Trifid nebula was founded by Charles messier.